One of the most important medieval histories, the 'History of the English Church and People' was written by Bede, a monk at Jarrow, about 730. Copied at Jarrow probably within a few decades of the original, this manuscript is written in the beautiful handwriting that was developed to supply the demand for their house-author's work. It was nearly destroyed in a fire in 1731. Another contemporary manuscript of the book survives in the library of St Petersburg. Bede wrote his history for the king of Northumbria, Ceolwulf, who was a devout although not strong ruler. The book tells the story of the conversion of the Anglo-Saxons to Christianity, based on sources Bede gathered from colleagues and other books, which he referenced in his work. This page tells of Augustine, the Italian monk sent by Gregory the Great to convert the Anglo-Saxons, and his conversion of King Aethelbert of Kent. 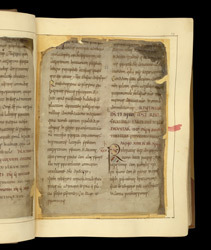 The first letter of the chapter is typical of the elegant, restrained style of decoration of Jarrow's scribes. The geometric design, narrow diagonal stripes of colour and pointed black shapes were inspired by the sophisticated book art of the Mediterranean.